So tomorrow RBI will release the Rs 200 currencies. The 200 note is supposed to reduce the burden of the RS 100 note. I am not sure if that would reduce the burden of the Rs 100 note. But it sure would reduce the burden of all the cops who would stop bikes and demand Rs 100 from the bike riders. From now on they can ask them to give Rs 200. I like these cops. They are not too greedy. They don't demand Rs 500 or Rs 2000 notes. They are happy with Rs 100. The big thoppai cop near AMBIT Ambattur once stopped my car because I was not wearing my seat belt. When he asked for bribe, I told him I would rather pay the fine. He finally settled for Rs 10 from which he bought one tea and pocketed the remaining Rs.3 in his pocket. The Rs 200 note will yet again have the father of our Nation- Mahatma Gandhi. It becomes boring to see the same face again and again. We should have our respected honorable Pradhan Mandhri Narendra Modiji's picture on our currency notes from here on. I would have also been happy if IlayaThalapathy Vijay Anna's picture was printed on the currency notes. Sleep cell sources also revealed that there is a green thread that runs through the center, which will turn into blue when the note is tilted. This can be used by all the guys to put soora mokkai magic tricks to attract women in colleges and in work places. The highlight of the currency note is its backside. The backside of the note does not have Gandhi's backside. Instead the motif of Sanchi occupies the backside of the 200 Rupee note. Sanchi Stupa is one of the seven wonders of India. Originally built by Asoka in 3rd century BC, this monument can single handedly teach us a lesson or two from our history. 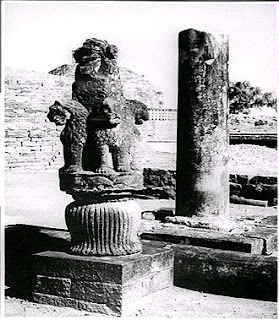 Our National emblem- Ashoka Pillar (The four lions) is found in this site. The fourth Lion is none other than Captain Vijaykanth (Raghuvaran confirms this in the film Narasimha). The backside of the Rs 200 note will also have Swachh Bharat logo. This is Modiji's master stroke; because of the "VARALAARU ROMBA MUKKIYAM AMAICHAREY" fact. 1) Rohit Sharma - for scoring two double hundreds. But his failure to land his bat while running between the wickets acted against him and he was rejected. 2) Sachin Ramesh Tendulkar - for becoming the first man to score a 200. May be his poor attendance in Rajya Sabha acted against his inclusion. 3) Sunny Leone - for single handedly pulling a 200 thousand crowd in Kerala with a cameo appearance to the state. Illuminati experts might bring in some new concepts and will find some triangle, an eye and a cat symbol somewhere in this currency and would soon spread some conspiracy theories. So be prepared to have a good laugh.